David Giuntoli as Nick Burkhardt, who discovers he descends from a line of Grimms; hunters who fight supernatural forces. He also works as a homicide detective. Russell Hornsby as Hank Griffin, Nick's homicide partner. Bitsie Tulloch as Juliette Silverton, Nick's girlfriend. Silas Weir Mitchell as Eddy Munroe, a former 'big bad wolf' who aids Nick with his cases. Wie geil ist das denn? Mal wieder was für mich, Mystik & Horror! Obwohl ich sagen muss, dass der Übersetzer Button doch manchmal einigen Blödsinn verzapft. Aber das Meiste hab ich verstanden. "Grimm": Ready for another twist on the highly successful procedural format of "CSI," "NCIS" and "Law & Order"? How about a twisted twist? 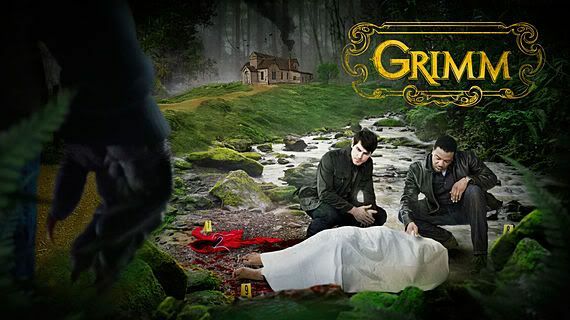 "Grimm" is a supernatural crime-fighting series that's set in motion once Portland homicide detective Nick Burkhardt (David Giuntoli, from MTV's "Road Rules") learns that he's a descendant of the Grimm Brothers. The catch? The Grimms weren't just creative storytellers. They were also underground criminal profilers, and threaded inside those timeless fairy tales are warnings of mysteries to come. 9 p.m. Fridays, NBC. Debuts Oct. 21. NBC has the series premiere of the new supernatural cop show Grimm, from the producers of Angel. After the mysterious brutal attack of a local college co-ed, Portland homicide Detective Nick Burkhardt (David Giuntoli) discovered he is descendant of an elite line of criminal profilers known as "Grimms," charged with keeping balance between humanity and the mythological creatures of the world. As he tries to hide the dangers of his new found calling from his fiancee, Juliette Silverton (Bitsie Tulloch), and his partner, Hank Griffin (Russell Hornsby), he becomes ever more entrenched in the ancient rivalries and alliances of the Grimm world. With help from his reluctant confidant, Monroe (Silas Weir Mitchell), a reformed Grimm creature himself, Nick must navigate through the forces of a larger-than-life mythology. I have already seen the pilot for Grimm and it's safe to say I'm obsessed. What else is coming up? We were just in Portland, Ore. on the set of Grimm and on Friday we will give you a look at all of our exclusive video and interviews! But for now here is a little scoop of Grimm ice cream to feed your obsession: So far we know that Juliette (Bitsie Tulloch) is in the dark about Nick's (David Giuntoli) evil-fighting profession, but Tulloch tells us her character will catch on eventually. "I think Nick is lying to me and maybe he's having an affair. He's secretive and moody sometimes and he's gone a lot. That's all I can say but it is very interesting how they reveal it to me." Oh, can't wait! Ich finde die Kritik nicht zu hart, ich kann ihr fast 100% zustimmen, Grimm kommt mir sehr, sehr lahm vor. Und da mich Serien entweder mit dem Piloten packen, oder nicht , ist das definitiv oder nicht. Wenn man überlegt was NBC im Vergleich zu theCW pro Folge springen lassen kann, ist das Ergebnis für mich in allen Bereichen dürftig. Ich sag ja nicht, dass sie zu hart ist. Man hört halt nur sehr selten EHRLICHE Meinungen. Die dürfte den Nagel auf den Kopf getroffen haben. Bedenkt man, dass die Serie Producer von Buffy und Angel an Board hat und dann sowas bei rauskommt. Und einen Punkt find ich wirklich super beschrieben: eine Serie steht und fällt mit den Cast. Wenn das lahm ist und nix rüber kommt zum Publikum, dann war's das. Mussten die sich ausgerechnet nen Reality Star angeln? Keine anderen Schauspieler frei? Jede Serie, die in die Fußstapfen von SPN treten will, hat es verdammt schwer. Ich weiß, ich bin fies - aber ich finde es prima. Ein ernsthafter Konkurrent weniger in diesem Genre und unsere kleine Show ist der Maßstab aller Dinge. Jake in Seattle, Wash: Grimm! What new monsters can we expect this season? Oh, what a wicked web Grimm weaves! We are really intrigued about a future episode which features Lena, a beautiful yet terrifying "Black Widow" creature who is cursed with a disease that causes her to age rapidly. The only cure to stop the aging? Kill three young men in three days by sucking the life out of them. Eek! But here is where the show really gets interesting: When Lena isn't preying on the innocent, she is driving a minivan to soccer practice and enjoying a simple suburban lifestyle. Makes you think twice about your neighbors, huh? Jessica: Your Grimm spoiler last week was so good! More please! Well, since you asked ever so nicely: Welcome to Grimm: Fight Club edition! The first rule of Fight Club: you do not talk about Fight Club (or the fact that you see evil monsters every single day.) In episode 12, we will be introduced to a Lowen, a lion-like creator appropriately named Leo who runs a gladiator-style fight club for Portland's mythological beings. Our money's on Tyler Durden Nick Burckhardt (David Giuntoli).